Every so often you hear something that immediately jumps out at you. 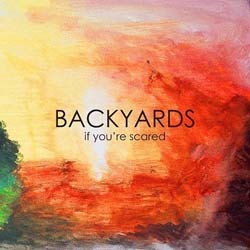 This is certainly the case with If You’re Scared, the debut EP from Backyards. The Leeds 5-piece blend beautiful harmonies with tender instrumentation to make truly lovely music. From the very start of Heavy Handed, the opening track on the EP, it’s clear that Backyards are not your ordinary band. Bryan Serwatka has one of those voices which ensnares you with both its fragility and depth. Supported by unobtrusive instrumentation, you gradually find yourself falling under their spell; heavy handed it is not. White Horses is the song that really makes you sit up and take notice of Backyards. Subtle musicianship and soft vocalisation come together to create something gently beguiling. It’s a song so unimposing and shy that it softly seeps into your psyche, when it ends you feel as though you’re waking from a dream. Call to Arms promises to be more direct, but simmers just below, never boiling over into a full-on assault. The Violin is wonderfully employed to lead the charge, building to a triumphant climax, before the plaintive lyrics fade-out into a hazy playground sample. Statues is the final song and is a more playful affair. It gently meanders before gracefully jamming quietly into the night sky. I’ve seen comparisons made with the likes of Arcade Fire and Radiohead, and whilst Backyards clearly draw inspiration from many quarters, they have a sound which deserves to be judged on its own merit. A collection of beautifully written and immaculately produced songs, which easily make Backyards the most exciting new band I’ve heard from Leeds in a long time.